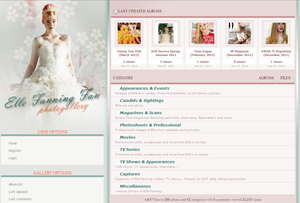 Elle Fanning Fan » Blog Archive » Elle Fanning Fan has new layouts! Elle Fanning Fan has new layouts! After 1 year with the same layouts, I added a new main layout and a new gallery layout here at Elle Fanning Fan. What do you think??? I really love both. Please, if you find some errors or watever, let me know. Also, if you have suggestions for the site, please, do so. Thanks for all your support.